Many corporate translation projects today are very complex. Fewer texts are based on paper documents, but all the more derive from web sites, software, databases, multimedia, engineering drawing files or publishing layouts, and they may often involve coordinated efforts for many languages for many formats. Project managers must work with specialists in a variety of fields such as translation, localization, software development and web design, advertising and commercial graphics. A roadmap is critical to cope with such challenges. Reliable roadmaps are based on grounded, practical knowledge of project management in general as well as the specifics relevant to localization. Project management not only helps organize and define strategies, but also provides flexibility: the flexibility to refine something which works to work even better, and the flexibility to respond when things don’t go as expected. Good project management increases the probability of success and offers peace of mind, which increase customer satisfaction and provide opportunities for growth. 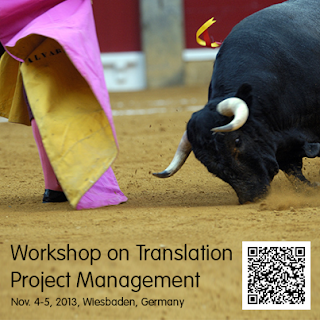 The workshop (in English) on November 4th and 5th in Wiesbaden, Germany will enhance your practical project management skills for translation and localization. It is designed for language service experts, corporate executives, project managers, heads of translation departments and translators interested in project management. The workshop will be taught by Loctimize partners Angelika Zerfass and Martin Beuster. Ms. Zerfass is an independent trainer and consultant for translation technologies with more than a decade of experience in the field, a frequent speaker at localization conferences and university lecturer. Mr. Beuster is the managing director at Context (Ireland) and has over 25 years of success in the language services industry. As a training consultant, he offers services to corporate clients, professionals in multi-lingual environments and language service providers. Further details and registration information are available here.